Brabus is taking center stage at the 2015 Dubai Motor Show with yet another tuning kit for one of Mercedes’ newest models. Coinciding with the unveiling of the Mercedes S63 AMG Rocket 900 Desert Gold Edition, the German tuner has now pulled the covers off of the Mercedes-AMG GLE 63S - 700. The new tuning program is for the GLE 63, Merc’s first offering to a coupe-SUV segment currently populated by the likes of BMW X6 and the Porsche Cayenne. The GLE has yet to gain the following that it’s competitors have had in years, but Mercedes, and Brabus by extension, hope to change that with programs like this one. On its face, the B63S - 700 checks all the required boxes of a comprehensive program. 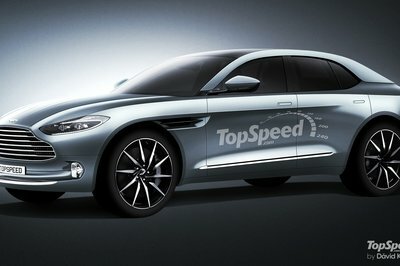 It has cosmetic upgrades, aerodynamic improvements, and engine enhancements. It even has a suspension update, which goes to show how detailed this kit really is. In the midst of all the changes made to the GLE 63, I still get the feeling that Merc’s coupe SUV still has to earn its keep. This Brabus program certainly gives it a little bit of credibility. But, that currency will only remain valid for as long as the GLE 63 is relevant. It’s too early to say how popular it’s going to be, but right now, it still has a lot of miles to cover before it can catch up with its more established rivals. Continue reading to learn more about the Mercedes-AMG GLE 63S By Brabus. As meticulous as Brabus is when it comes to its programs, there are times when the German tuner opts for subtle improvements instead of its penchant to go over-the-top. Such is the case with this program. The GLE 63 gets a few cosmetic and aerodynamic improvements, beginning with a front spoiler lip that helps cut down the lift on the front axle. This, in turn, helps the SUV’s overall handling stability. The side air intakes also gets their own upgrades in the form of ailor-made air deflectors with integrated LED side markers. The rear section also gets its share of new items. Just like the front spoiler lip, the roof spoiler at the back serves the same function of reducing lift on the rear axle. A new diffuser has been put in place to complement the pair of ceramic-coated designer tailpipe tips on the exhaust system. Carbon surrounds on the side air outlets are aesthetic additions. The last addition to the GLE 63 is the new set of Monoblock Y "PLATINUM EDITION" high-tech forged wheels. Customers have a choice of availing these wheels in either 21-, 22-, or 23-inch sizes and should have no problem finding suitable tire partners from Continental, Pirelli, or Yokohama tires. The interior of the GLE 63 has been dressed to the nines, even if the overall layout remains the same. The highlight of the modifications is the azure-blue Mastik leather. The color creates a nice contrast to the black leather that’s been fitted throughout the cabin. Square quilting patterns can also be seen on the seats and the center sections of the door panels. Brabus also added a number of custom accessories to complete the interior upgrades. For starters, the stock door lock pins and pedals have been replaced with aluminum. 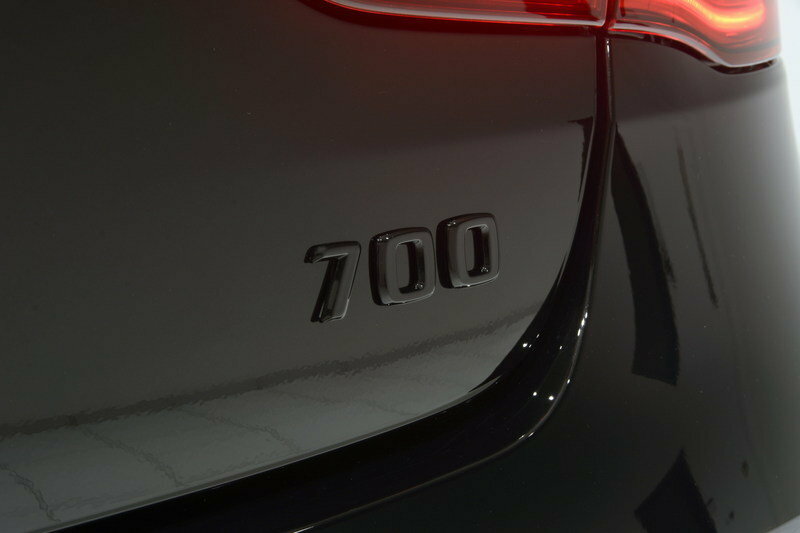 Stainless-steel scuff plates, each with a backlit logo of the German tuner, have also bee installed to match the crossover’s interior ambience lighting. 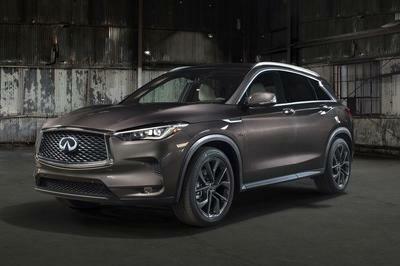 As most high-performance SUVs go, performance is one of the most important, if not the most important quality to have. Mercedes-AMG addressed that by giving the GLE 63 S a 5.5-liter, twin-turbo, V-8 engine that produces an impressive 577 horsepower and 561 pound-feet of torque. Fortunately for us, Brabus took that engine and its corresponding numbers and determined that it wasn’t enough, hence the addition of the new B63S - 700 performance kit that adds massive amounts of power to the SUV. Just like the recently reviewed S65 AMG Desert Edition, Brabus added two special turbochargers to the V-8 mill of the GLE 63. These turbos come with larger compressor units, allowing them to produce higher boost pressure that aids in a smoother power distribution from the engine. 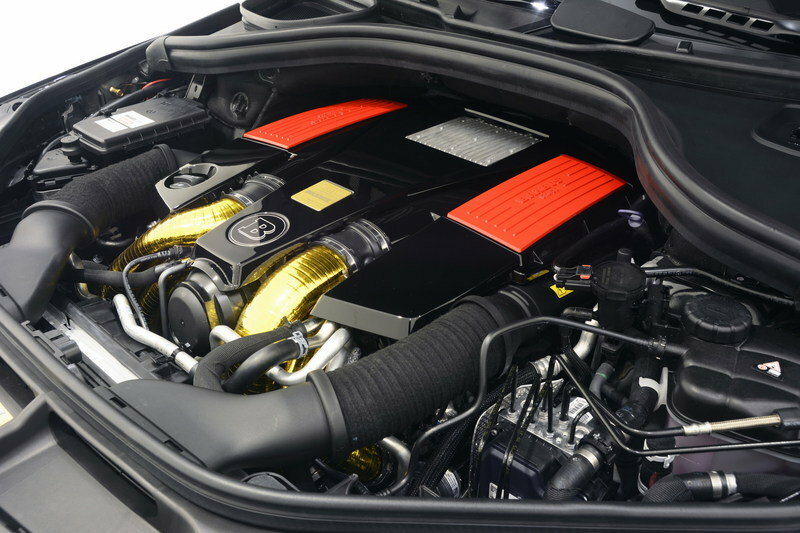 The German tuner also installed gold sheathing on the intake and charge-air pipes. In addition, a new exhaust system with free-flow catalysts and 3-inch down pipes have been put in place to create better interplay among the new components. 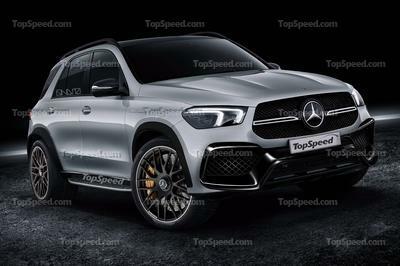 As a result of these modifications, the GLE 63 is now able to produce an astonishing 691 horsepower and 708 pound-feet of torque — good enough to drop the SUV’s 0-to-62-mph sprint time from 4.2-seconds to a 4.0-seconds and improve the top speed from 155 mph to 186 mph. The improved output still sends the power generated by the V-8 to the two rear wheels courtesy of a new SPEEDSHIFT PLUS 7G-TRONIC transmission system. If these numbers aren’t up to your liking, Brabus is also offering a separate engine program that’s already been featured in these pages back in September 2015. This program, called the Brabus 850 6.0 Biturbo 4x4 Coupe, is based on the Mercedes GLE 63 Coupe. The displacement has been increased to 6.0-liters and the resulting output hitting 850 horsepower and 1,069 pound-feet of torque. If you thought the 700 kit is fast, the 850 is much faster. 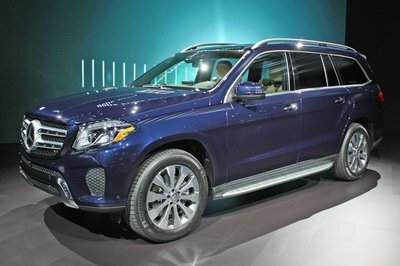 It provides the GLE 63 enough juice to propel from 0-to-62 mph in 3.8-seconds to go with a top speed of 200 mph. Brabus’ commitment to improving the SUV’s cosmetic and performance characteristics didn’t come at the expense of the GLE 63’s suspension. The German tuner also did work on that regard, adding a control module for the AIRMATIC air suspension. The setup drops the SUV’s overall ride height by 1.4-inches, resulting in a lowered center of gravity that should help improve its handling capabilities. Brabus hasn’t listed a price yet for the B63S - 700 performance kit but if the previous 850 program is any indication, don’t expect this upgrade to come cheap. The 850 has a listed price of €289,218.79, which would be around $324,600. Doing a little mathematical gymnastics, the B63S - 700 tuning kit could be priced at somewhere around $270,000. That’s just a rough estimate on my part so don’t take that to the bank. Topcar finally got its hands on the 2015 Cayenne; is it a keeper or not? The Porsche Cayenne Turbo S has its share of admirers in the tuning world so it’s no surprise that there are a number of programs available for the SUV. For what its worth, though, one of my favorites comes by way of TopCar. Despite not having any performance upgrades for the Cayenne, the Russian tuner sure knows how to dress up the German SUV. The aero kit itself is made up of the good stuff, including carbon fiber and Kevlar. The front section received a new front bumper with LED lights, a new hood with air intakes, extenders, and new linings on the front fenders. New side skirts are also part of the ticket, as are the linings on the front and rear doors, rear bumper, exhaust tips, and rear spoiler. 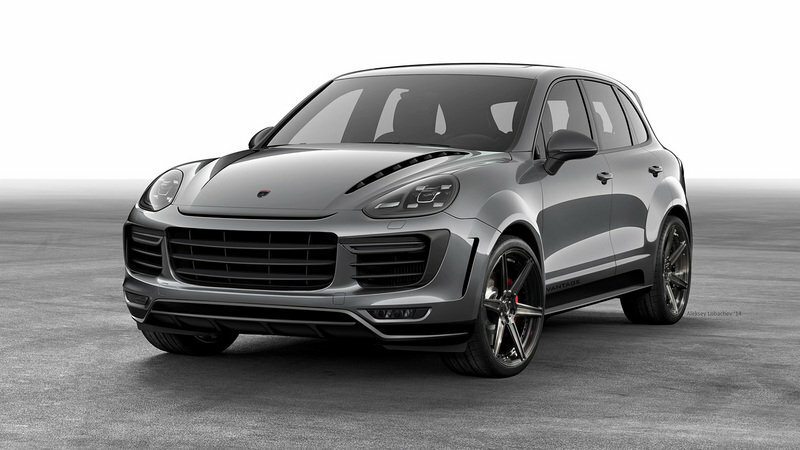 Like I said, TopCar has no engine programs for the Cayenne Turbo S, but that shouldn’t be a problem for an SUV that has a 4.8-liter, twin-turbo, V-8 engine that produces 570 horsepower and 590 pound-feet of torque. That’s good enough to propel the Cayenne from 0-to-62 mph in 3.8-seconds to go with a top speed of 177 mph. Read our full review on the Porsche Cayenne Turbo S by TopCar here. This particular program is a bit long in the tooth since it’s about the 2012 Jeep Grand Cherokee. But, just because it was presented a few years ago, it doesn’t mean that what Hennessey was able to do has aged with the times. The fact is, getting a Jeep Grand Cherokee — an SUV not known for its over-the-top performance capabilities — to generate close to 800 horsepower is a tremendous achievement in itself. Hennessey was able to achieve that by using its HPE800 Twin-Turbo engine package to complement the SUV’s upgraded transmission system and torque converter. The result speaks for itself. With a standard output of 465 horsepower and 465 pound-feet of torque, the Grand Cherokee SRT8 went home with 805 horsepower and 823 pound-feet of torque under its belly. The resulting performance numbers are incredible too. With the Hennessey program in tow, the Grand Cherokee SRT8 was able to sprint from 0-to-60 mph in just 3.1-seconds — a ridiculous leap from the 4.8-seconds it takes a standard version of the SUV to cover the same ground. Unfortunately, Hennessey only made 24 units of the SUV so don’t expect Hennessey to have one at its disposal at this point in time. Even if it did have some units left, the asking price of $235,000 could dissuade a lot of potential buyers. 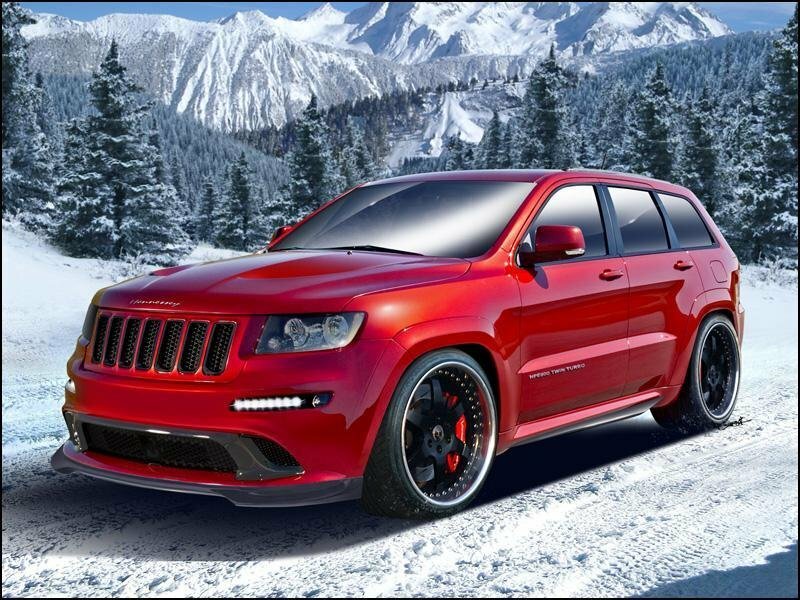 Read our full review on the Jeep Grand Cherokee SRT8 by Hennessey here. Brabus is always on-point when it comes to its programs. The German tuner knows what it’s doing and that was evident yet again with this new program for the GLE 63. 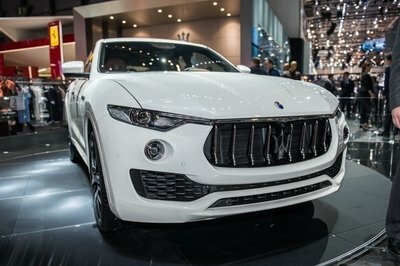 At the very least, it should quiet the concerns some people have of the SUV’s struggles in standing out in a market as competitive as the one it’s in. If that was the case, then there’s nothing like a little treat from Brabus to put the tape on those critics. My only concern, as is always the case with Brabus, is the price. I get why the company charges so much for its programs, but in doing so, I hope that it understands the drawback that comes with it. Owners of the GLE 63 are likely to just opt for a different tuner than have to pay Brabus an arm and a leg to get its performance kit. With that much power under its hood, can you handle it? Brand-new on the market and already exclusively and professionally refined: BRABUS (Brabus-Allee, D-46240 Bottrop, phone + 49 / (0) 2041 / 777-0, fax + 49 / (0) 2041 / 777 111, Internet www.brabus.com) presents the BRABUS 700 Coupe based on the new Mercedes GLE 63 S in a world premiere at the DUBAI INTERNATIONAL MOTOR SHOW 2015. This high-performance SUV capable of reaching a top speed of 300 km/h (186 mph) includes a 5.5-liter twin-turbo engine uprated to 515 kW / 700 HP (690 bhp) and 960 Nm (708 lb-ft), sporty carbon aerodynamic-enhancement components and 23-inch high-tech forged king-sized wheels. The BRABUS fine leather interior with quilted azure-blue seats and door panel elements creates an especially luxurious atmosphere. The new B63S - 700 performance kit from BRABUS significantly boosts the power and torque of the 5.5-liter twin-turbo engine in the GLE 63 S, which in standard specification is rated at 430 kW / 585 HP (576 bhp). Producing an additional 85 kW / 115 HP (114 bhp) necessitates numerous modifications to the peripherals of the turbocharged eight-cylinder four-valve engine. 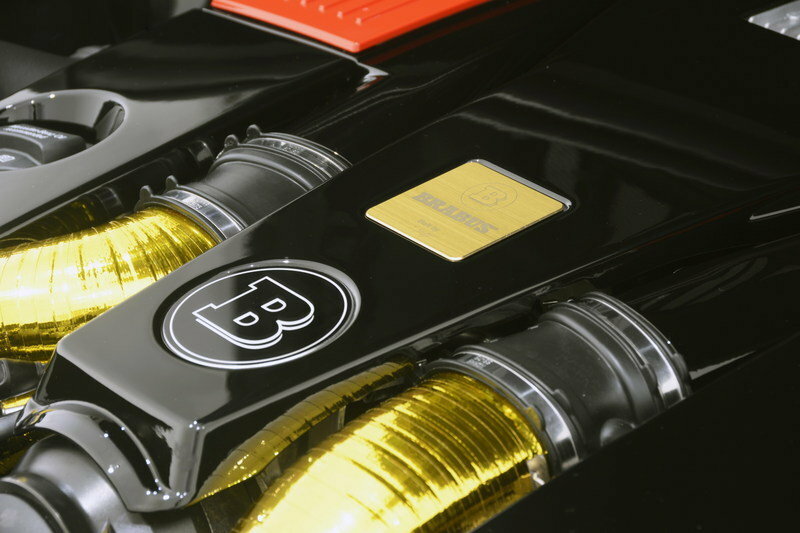 While the intake and charge-air pipes immediately attract attention due to their BRABUS Gold Heat Reflection sheathing, other important details of the conversion remain hidden from view. These include the two BRABUS special turbochargers with larger compressor unit, which produce a higher boost pressure than the production turbos. The standard emission control system is replaced with an exhaust system featuring free-flow metal catalysts and down pipes with a diameter of 75 millimeters (3 in). In addition, a BRABUS stainless-steel sports exhaust system with actively controlled butterfly valve is available for all GLE 63 models. It gives drivers the option of choosing between a subtle “Coming Home” mode and a markedly sporty exhaust note at the touch of a button on the steering wheel. The interplay of all high-performance components was perfectly coordinated with new mapping for ignition and injection by the BRABUS engine and electronics engineers using state-of-the-art test benches and test runs on public roads and racetracks. The result is an optimal blend of outstanding performance and impeccable stability. 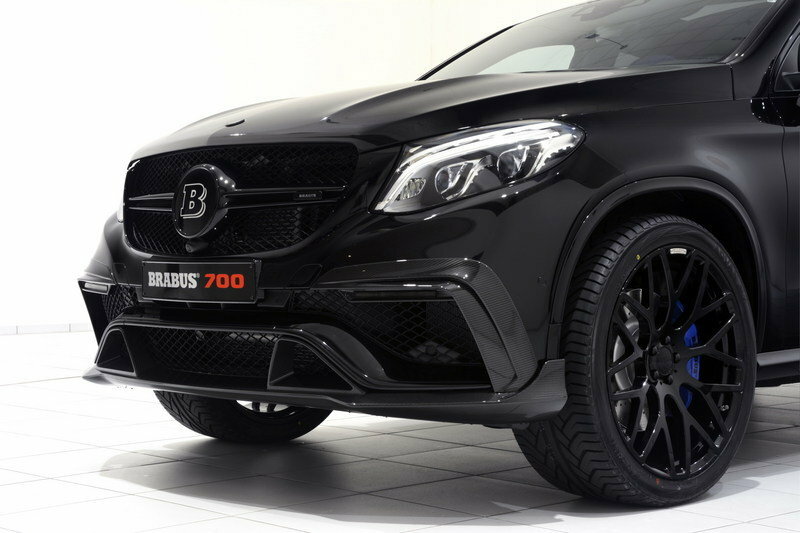 As the model name BRABUS 700 indicates, the driver of the exclusive SUV Coupe has command over 515 kW / 700 HP (690 bhp) between 5,300 and 5,800 rpm. Just as impressive is the increase in peak torque to 960 Nm (708 lb-ft), which is on tap between 2,000 and 4,500 rpm. The combination of the sheer power of the BRABUS 700 engine with the SPEEDSHIFT PLUS 7G-TRONIC transmission results in performance on the level of sports cars. From rest, the all-wheel-drive car accelerates to 100 km/h (62 mph) in just 4.0 seconds. The BRABUS Vmax unit included in the engine conversion bumps the top speed to 300 km/h (186 mph). 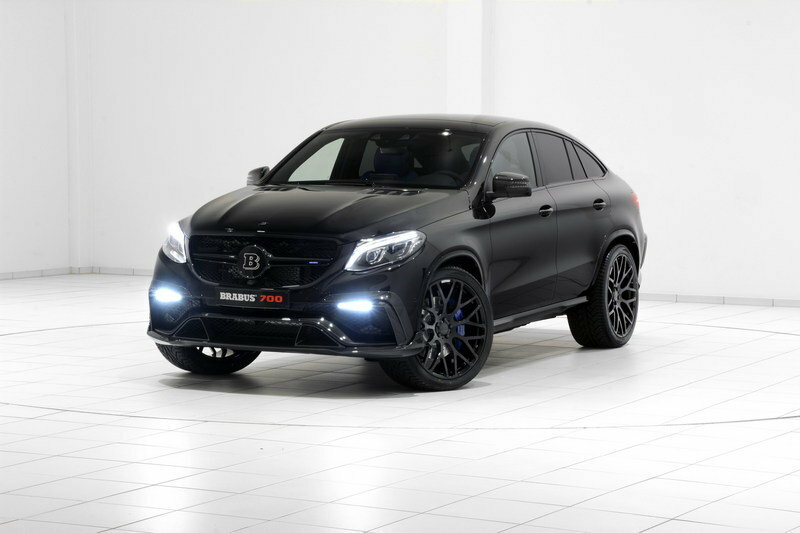 Anyone looking for even more performance can opt for the BRABUS 850 6.0 Biturbo 4x4 Coupe based on the Mercedes GLE 63 Coupe. Its twin-turbo V8 engine with an increased displacement of six liters produces a power output of 625 kW / 850 HP (838 bhp) and a peak torque of 1,450 Nm (1,069 lb-ft). This supercar accelerates from rest to 100 km/h (62 mph) in just 3.8 seconds and reaches an electronically limited top speed of 320 km/h (200 mph). At these speeds, the aerodynamic properties of the SUV weighing almost 2.4 tons also play an important role. 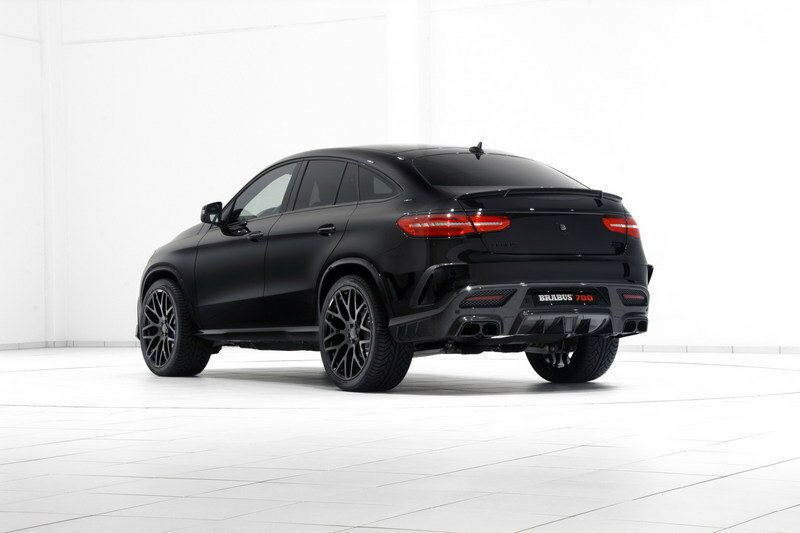 For this reason, the BRABUS designers developed bodywork components for GLE 63 made from high-tech carbon, which do more than just emphasize the sporty look further. The BRABUS front spoiler lip attaches to the lower part of the bumper and upgrades the SUV visually. It also reduces lift on the front axle at high speeds, further optimizing handling stability. The side air intakes in the front bumper are upgraded with tailor-made air deflectors with integrated LED side markers. 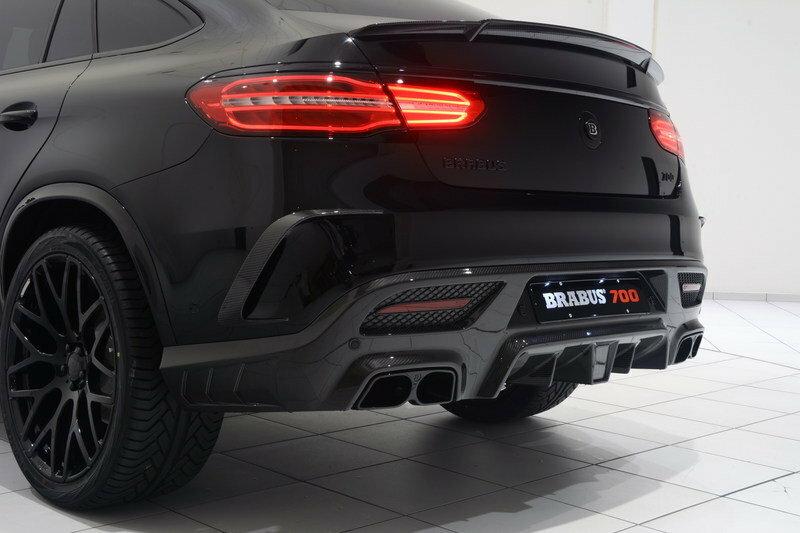 The rear of the GLE 63 receives some added sporty character with the BRABUS diffuser, which provides the perfect backdrop for the high-performance exhaust system’s two ceramic-coated designer tailpipe tips sporting the BRABUS logo. BRABUS carbon surrounds for the side air outlets are also part of the new look as is the BRABUS roof spoiler that further reduces lift on the rear axle. BRABUS alloy wheels for the GLE 63 are available in various designs and sizes with diameters of 21, 22 and even 23 inches. The most exclusive option features the new king-sized 11Jx23 BRABUS Monoblock Y "PLATINUM EDITION" high-tech forged wheels. Thanks to state-of-the-art manufacturing technology, these wheels offer an unrivalled combination of lightweight construction and maximum strength. 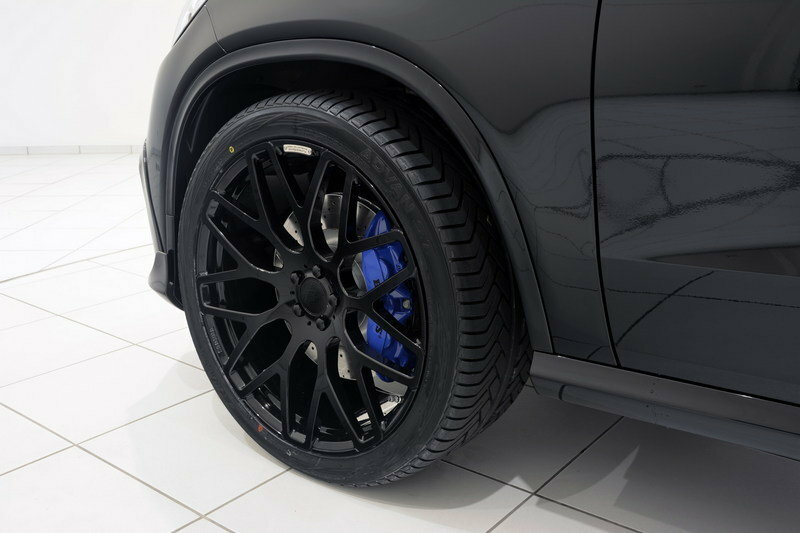 BRABUS technology partners Continental, Pirelli and YOKOHAMA supply the matching high-performance tires. A special BRABUS control module for the AIRMATIC air suspension lowers the ride height of the high-performance SUV by about 35 millimeters (1.4 in). This gives the all-wheel-drive car a more thrilling appearance and lowers the car’s center of gravity for further enhanced dynamic handling. Of course, a BRABUS fine leather interior ensures maximum individuality at the highest level of perfection in the GLE 63 as well. BRABUS selected an azure-blue Mastik leather from the virtually limitless range of fine leather hides for the show car at the DUBAI INTERNATIONAL MOTOR SHOW 2015. It sets a colorful contrast to the black leather of the rest of the interior and the black exterior with a square quilting pattern on the seats and the center sections of the door panels. Other exclusive features of this vehicle conversion are custom accessories such as aluminum door-lock pins and pedals as well as stainless-steel scuff plates with backlit BRABUS logo, whose colors match those of the interior ambience lighting.